Day 1- not so bad. I followed the plan that I had laid out and that made today very easy. Breakfast was a couple of scrambled eggs and a green smoothie made of an orange, a little bit of pineapple and about a cup of spinach. It was different to have my smoothie without the protein powder, but it was still good. I was definitely satisfied after my short run and felt full until lunch. For lunch I made tuna salad with homemade mayonnaise and served it with avocado and had a side of raw carrots. The homemade mayonnaise was a little different, but it was still really good. I did feel my usual afternoon slump around 2:30-3:00, but I wasn't expecting this to go away immediately. That tired feeling stayed for about an hour or so, but I started making dinner and by the time it was time to eat, I felt fine again. I modified dinner from the recipe. As I was cooking the artichokes and onions I got the idea to just brown the ground turkey, add the spices and then add a couple cans of crushed tomatoes. Basically instead of making meatballs, I just made a sauce. 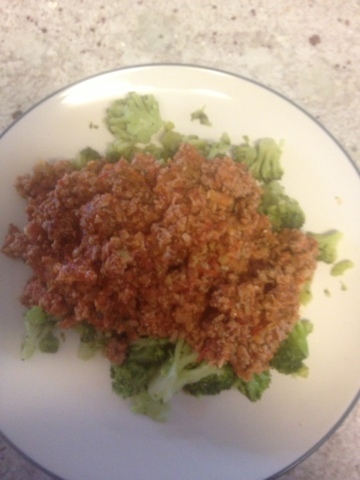 I let the sauce simmer for about an hour or so and then served it over some steamed broccoli. 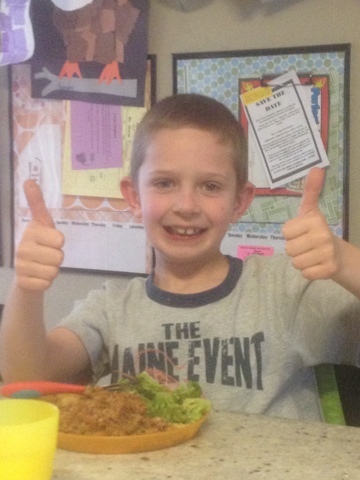 I was very happy with this dinner and it got me two thumbs up from everyone! I finished off the meal with a handful of cashews- the meal was missing a little bit of fat. Overall today was a good day, I did attempt a short run- but I've had a bit of a cold/allergy thing going on, so I was having trouble catching my breath. I didn't have too many sweet cravings, just a couple times throughout the day.